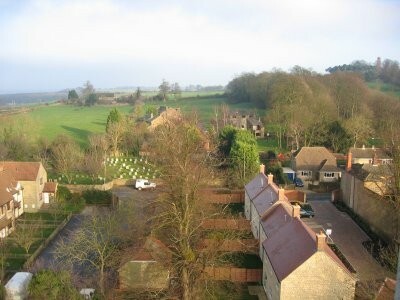 Pictures from the Crane 2004/5 - Faringdon Community Website. The sun appeared just in time to brighten up this view of the Church of All Saints. Most of the rest of this picture is taken up by Eastfield Court, Church Street, occupying the centre horizontal axis. The rear of Church Street, with All Saints to the left and - just visible, the Radcot Road to the right. Small developments have been erected where the large gardens of the imposing buildings in Church Street used to be, You can see one on the extreme right. The large garden in the foreground belongs to the house visible through the trees at right angles to the road, and beyond it can be seen the Coach House, with it's arched enntrance - part of Faringdon House Estate. Faringdon House itself is sadly not visible, being behind the trees, although a really hard look can just discern part of the roof! 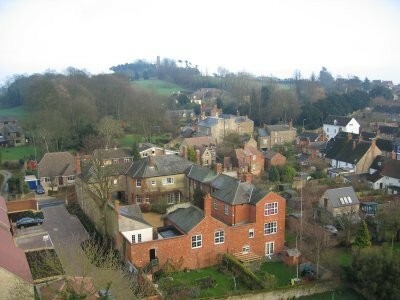 The Thames Valley stretches beyond the edge of the town here at Church Street, and Radcot Road is just visible in the centre. 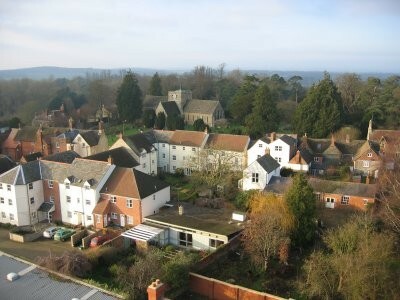 The large houses to the right are part of Faringdon House (Berners) Estate, and you can see the new development of Church View in the middle, a terrace of small houses. The Coach House is more easily seen here, although it isn't very clear which houses are on which side of the road! This is the north aspect from the edge of the town, stretching away towards the Thames. The tall house in the centre of the picture is on the corner of Church Street and Coach Lane, and beyond it there is a bungalow on the corner of Coach Lane and Church Path, - footpath to Littleworth. 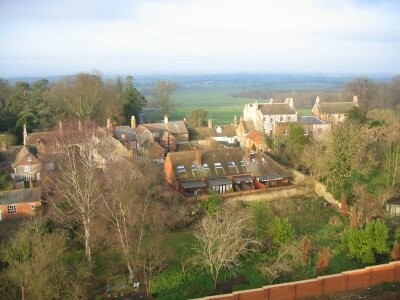 On the right you can see part of Coomes Close, built on the site of a large garden, formerly belonging to Faringdon House and used as an allotment by a local resident. The triangular piece of land at the lower edge of the picture is part of the present Macarthy and Stone development. 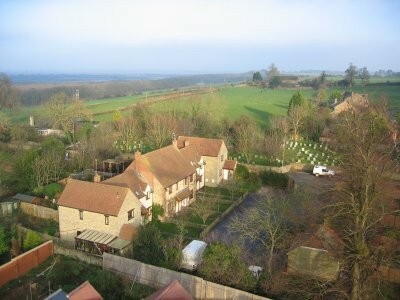 A good view of Coomes Close, and the burial ground beyond. The houses behind the burial ground are part of a small upmarket development of large houses. The building just visible in the distance is Church Path Farm, and the footpath which passes it is the right of way to Littleworth, and crosses the Faringdon Circular walk about half a mile further on. 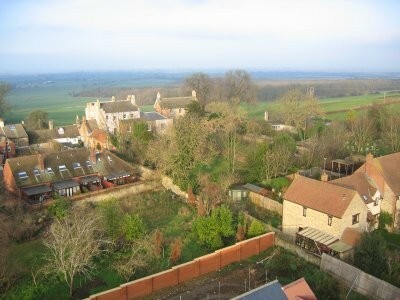 In the foreground here, the most recent development at this end of the town, 'Cotswold Gate'. Built on the site of Lime Tree Cottage, it replaces the rather unpreposessing former home of lady Dorothy Heber Percy (formerly Lygon) with an equally unprepossessing row of small terraced houses. The Folly Tower can be seen here on the horizon to the right , with (centrally) Sudbury Court development of 'executive homes', and Church Path Farm beyond. Returning to the beginning of the tour, here again the Old Police Station, now five separate dwellings. This was once, not so long ago - the site of a busy local police sation, and local magistrates' court. 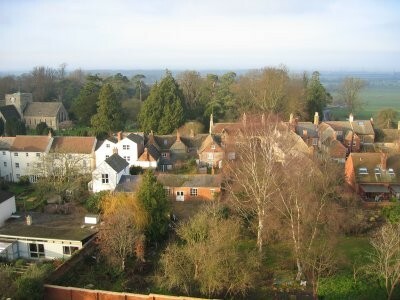 Just below and to the right of the Folly tower, Sudbury House hotel is visible. Before it was turned into a hotel, it was the home of Sir William Glock, (deceased), former director of BBC Music.